While you might already be familiar with the field of prosthetics for a career – where artificial parts such as limbs are custom made for patients – did you know you can specialise even further? The design and fitting of limbs is the most common area of prosthetics but if you consider that our faces are the first thing people see, you can understand how the specialised area of ocular prosthetics – for the eyes – is an important one. In the United Kingdom (UK), the National Artificial Eye Service (NAES) plays a key role because it produces the ocular prosthetics required by patients. It also guides the fitting of ocular and other prostheses for the face. Since the level of detail and aesthetics are far more advanced and challenging to successfully design and fit an ocular prosthetic, this role will suit a person with important skills and traits. For the UK, careers in this area can involve ocular technology work, which relates to working in a laboratory environment. 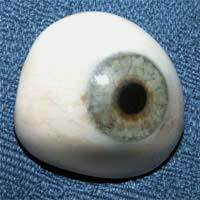 A prosthetic eye is not simply a mass manufactured product. Instead, it is carefully made and even painted by hand. If you have a keen eye for aesthetics and detail, then this may be a suitable role for you to choose. Given the challenge of precisely matching up the prosthetic eye to the healthy one for a specific individual, you will need to have superb coordination and visual skills for discerning between colours. It's important to have some education and experience in the art field as well although your employer will train you to some extent. If you prefer to work directly with patients, you can choose to work as an orbital prosthetist. In this role, you would actually work with a patient to fit the ocular prostheses. Also, you would provide information and recommendations on how to look after the prostheses and ensure it provides maximal comfort and durability. To excel in this role, you should have good interpersonal skills and enjoy working with patients. You also need to train in basic anatomy to understand how to successfully fit the prostheses. You could work in any one of a number of specialty ocular clinics around the UK. As with an ocular technologist career, you would receive quite extensive training from your employer, which could take up to a year. However, unlike the more art and technology based background needed for an ocular technologist career, your background should be based in the sciences and should also involve experience working with patients. While prosthetics work in general is important for patients, specialising in a career in ocular prosthetics is a wonderful choice for helping patients to look their best and avoid the negative reactions and stigma that come with losing an eye. You will help patients to gain back self-confidence and will help them to socialise more and experience a stronger sense of self. If you want to work in ocular prosthetics, you might want to speak to someone already working in the field, who can provide advice and support for how to excel in this unique, specialty career area.